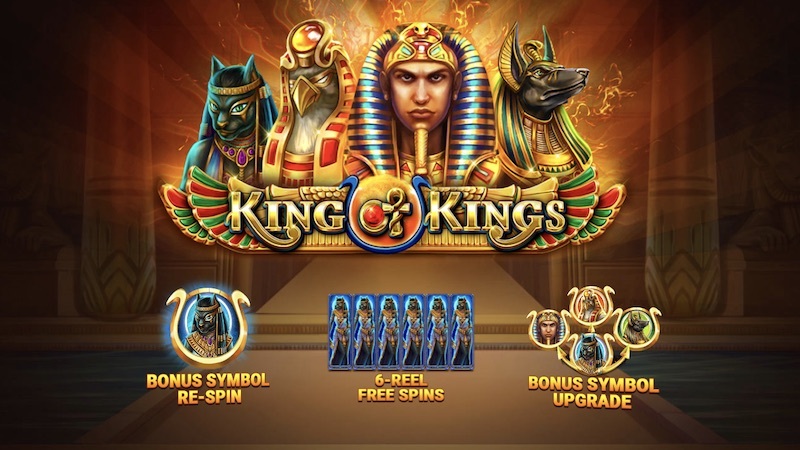 King of Kings slot from Relax Gaming is a bit different in how it works, and also offers the potential to win some big jackpots, but at an extra cost. Is it a slot for you? Carry on reading to find out more. 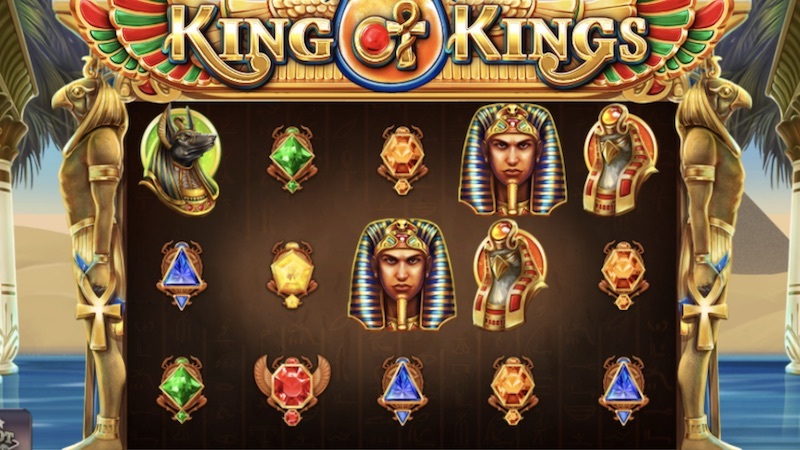 As you can see, there are quite a lot of symbols in King of Kings slot. Interestingly, all of these are different values which is a bit unusual. The Wild symbols is the most valuable and also substitutes for all other symbols in a winning combination, making it that more valuable. Free Spins Bonus. If you’re thinking, well hang on, the Wild symbols surely doesn’t substitute for the Scatter symbol, does it? Well no it doesn’t because there isn’t one. Instead, the Wild symbol is used as a Scatter, with 3 or more of them anywhere on the reels unlocking the Free Spins Bonus. You’ll be given 10 free spins at the beginning of the Bonus, and you’ll unlock an additional reel also. Interestingly, any symbol other than the Wild symbol can be a Bonus symbol in the Bonus, and when a number of these form a win, that particular symbol will cover the reel, move to the left and pay on all lines. Furthermore, landing at least 2 Wilds will give you another free spin. If you land 3 or more Wild symbols during the Bonus, you’ll be given another 10 free spins, as well as upgrading the Bonus symbol. Bonus Symbol Respin. If you only manage to land 2 Wild symbols, you might be given a Bonus Respin. Any other symbol apart from the Wild can be a Bonus during this respin. Jackpot Stars. As the name probably suggests, this is a Jackpot feature which you can activate by clicking on the logo on the bottom left and placing an additional bet, added to your regular stake. You’ll trigger the Bonus when all 3 stars are lit as a result of a draw. You play the Bonus on 6 reels and all apart from the ones filled with sticky symbols will spin. Red balls will come onto the reels at the end of the spin, sticking in place for the whole Bonus. This will continue until all reels are filled with sticky symbols, with respins being awarded at random. The Bonus will end until no more respins are left and there are no more reels to fill, with your Jackpot then being determined. The more red balls, the bigger the Jackpot. King of Kings slot from Relax Gaming is an interesting one. It plays a bit differently to most slots, what with the Wild symbol being a valuable, Scatter symbol also. The main focus is on the Free Spins Bonus which is quite unusual and I’m not too sure how I feel about it. I do like how you can win quite a few more free spins though. Then there’s the Jackpot Stars feature for those of you looking to make some big wins. It’s quite an expensive option, but the rewards can be generous so it’s up to you. I’m not sure the slot has much substance without it though, and I don’t know how many people will enjoy this game. Feel free to give it a go though, and check out some of Relax Gaming’s other slots here. Jackpots come at a large cost.